A rainwater harvesting system collects water that would otherwise be lost to stormwater drains, cleans it and stores it for garden irrigation and indoor use. Ensures you have a continuous supply of freshwater in case of natural disaster. 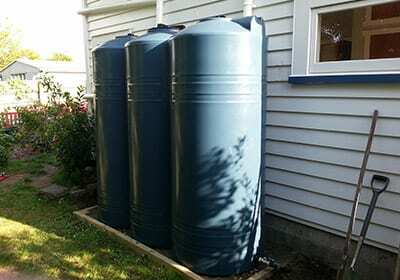 Think Water Auckland installs home or residential water harvesting systems and larger scale commercial water harvesting systems throughout the greater Auckland region. Only 3% of the water used by a typical Auckland household is for drinking or cooking – the vast amount of majority of the water you pay for gets flushed straight down the drain. Why pay to use city water supplies when you can take advantage of a Think Water Auckland rainwater harvesting system and use the free water that lands on the roof of your property? Find out more about how to save money by having a domestic rainwater harvesting system installed at your place Residential Rainwater Harvesting. Businesses, sports clubs, commercial property owners are often amazed at the huge savings – thousands of dollars yearly – that can be made by collecting and utilising the rainwater from the roofs of their buildings. But the money saving is only the start of it; you can promote your business or club as environmentally friendly which is a real selling point for many clients today. Find out more about how to save money by having a commercial rainwater harvesting system installed at your place Commercial Rainwater Harvesting. Find out more about how a Think Water Auckland rainwater harvesting system could save you money Contact Us.